At the 30th Annual NERIC Technology Awareness Day Conference in December, Erin Sheevers, Amy Fraser, Christina Kole, and Shannon Haegle from Troy City School District (TCSD), alongside eleven students, introduced the audience to STEAM days. STEAM days, a now fundamental part of the TCSD school year, take place during a regular school day and feature a series of activities and sessions that focus on technology. The activity promotes student choice, independence, and creativity in a hands-on environment, which keeps students engaged and eager to learn. The students learn the same curriculum in an alternative way; instead of lectures, students learn math through Minecraft. Instead of listening to the same teacher every day, students hear from individuals around the world in virtual field trips through video conferencing. At TCSD, students are gaining knowledge, having fun, and discovering what it means to be a safe and responsible digital citizen. Erin Sheevers, the Director of Technology for TCSD, believes that technology exists as a tool to enhance learning, to engage students more effectively, and to better differentiate and meet all students’ needs. Sheevers describes STEAM days as advertisements for what technology has to offer; they give teachers a taste of things they may not have considered before, like how robotics can be a part of the math curriculum or how video calls can relate to their literacy curriculum. STEAM days began as half days, but after the district saw significant growth in attendance, student engagement, and student participation, they increased the length of the activity to a full day. Students look forward to the activity so much that they expressed genuine disappointment when a snow day interrupted a STEAM day. 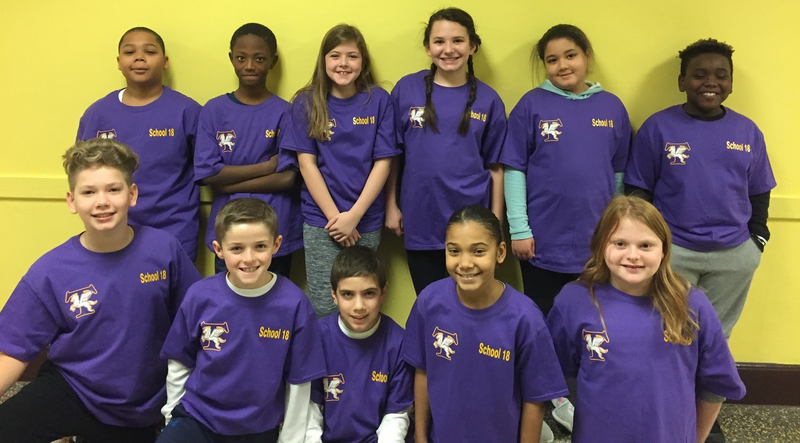 Now, STEAM days at TCSD occur on a monthly basis at the five elementary schools in Troy, and include activities ranging from makerspaces to Lego robotics to video-conferencing sessions. According to the TCSD Information Technology Plan, one of the district's goals consists of equipping students with core 21st century skills, including foundational skills, critical thinking skills, communication and collaboration skills, workplace skills, and technical competencies. All buildings have a building technology liaison that “will be trained and serve as a resource for each building” (TCSD Information Technology Plan). Additionally, district technology coaches for training, resources, and other embedded PD opportunities became accessible. Amy Fraser and Christina Kole, certified teachers, are responsible for integrating the technology into the classroom and serve as the district’s Technology Coaches. Because they were teachers first, they can help other teachers understand new concepts and technologies better than a technician could. "If you’re going to invest in technology, you have to invest in people," Sheevers advises. "If you just give people devices, that means nothing. You must have people to train them on how to use those devices." In order to ensure success, student and staff surveys are given bi-annually to gather feedback. After the district upgraded their infrastructure and assigned coaches to help teachers integrate the technology, the administration could embed technology into the curriculum. Sheevers emphasized the importance of a substantial infrastructure; “you can’t have mobile devices without having a solid infrastructure. Once we had a solid infrastructure in place, then we were able to buy more mobile technology in the classroom that could be used as instructional tools,” Sheevers stated. If you’re going to invest in technology, you have to invest in people. If you just give people devices, that means nothing. You must have people to train them on how to use those devices. Their district moved from chalkboards to video conferencing in every classroom very quickly. “That was a huge transition,” Sheevers admitted. “We really didn’t know all the opportunities that were out there and how we could impact our students.” The Ed-Tech Coaches needed to find a way to help teachers learn how they could incorporate technology into their lesson plans, a concept that was new to everyone. Additionally, building a relationship between the technology coaches and the teachers took time and effort. As there are only two technology coaches for the district, Fraser and Kole could not be everywhere at once. TCSD includes five elementary schools, a middle school, a high school, and an alternative learning program, and Fraser and Kole are the only assigned technology coaches (although TCSD has a substantial technology department). As a solution, the coaches sought to empower the teachers to use the technology on their own. Sheevers, Fraser, and Kole admit that finding time to provide professional development (PD) to introduce new technologies was difficult: they tried before school, during lunch, and after school. They even tried a “PD in Pajamas” session at night. Eventually, they found success in an embedded form of practice, where a technology coach worked alongside the teacher in the classroom. Embedded PD helped the teachers become comfortable using the technology on their own. “The students are so eager to learn. They’re so much more engaged. They want to be in the classroom and doing these activities, and I think that’s a big motivator for teachers, too,” Sheevers expressed. Above, right: Students learning the alphabet on a laptop in class. Above, left: Students connecting with another class through video-conferencing. The district utilizes videoconferencing to introduce the students to numerous unique perspectives and knowledge. TCSD installed Cisco Telepresence MX800’s in every classroom, which provides teachers the opportunity to teach mini-lessons across classrooms and connect with schools and institutions around the world. 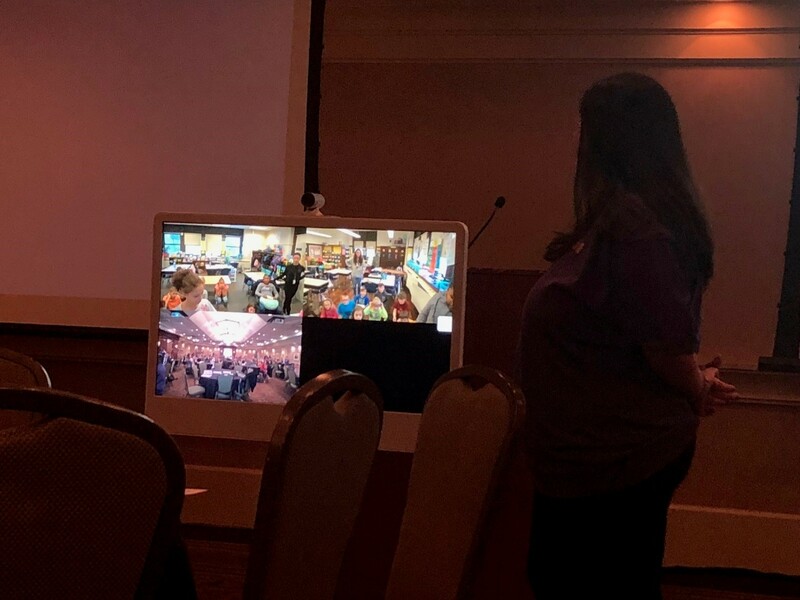 Videoconferencing provided the students at Troy an opportunity to connect with author Charles Smith and Laurie Halse Anderson, a New York Times-bestselling young adult author. The high school connected with an elementary school in the district and demonstrated a dissection and a taught a science lesson about energy. A mathematics professor from Siena College connected with a math class at TCSD and taught the students how to analyze and predict voting results in Florida during the election as the students were studying voting and data analysis. The students collected data that was published in a news article, which allowed them to practice a real-life application of knowledge. Videoconferencing allows the students to gain perspective through virtual field trips. A parent of one of the students, who is a pilot, video-called into Fraser’s classroom and showed the students what the inside of a plane looked like. Another student’s parent went to Japan to visit her sister and called into the classroom to demonstrate to the class what life was like in Japan. Another student was faced with missing a lot of school as a result of a parent’s illness. By incorporating this technology, the teacher had the ability to video him into class every day. Another added benefit is that teachers can call each other for help and teach lessons to entire grade-levels through videoconferencing. Students have the ability to play "Guess Who" across classrooms; they choose a character from a book they have read and create questions for their peers. Middle schools can connect with the elementary schools to get a feel for the environment and meet the teachers. Additionally, many museums, aquariums, and zoos often provide free video conferencing to schools. A Telepresence is not necessary to video conference, but Sheevers admits that having one platform throughout the district is very helpful. There was a point when all our kindergarten students could use a mouse. Now, they come in and try to poke the computer or swipe the screen. There’s a whole new set of skills to teach them. Sheevers connecting with two classrooms at TCSD through video conferncing at the NERIC conference. During the students’ demonstration of STEAM days at the NERIC conference, I asked some of the them about their favorite parts of coding. Lauren, a fifth-grader, said she enjoyed “getting to problem-solve when it stops working because you get to work with your friends.” John, a fifth-grade student, said “coding is still work but in a more fun way.” Joey, another fifth-grader, exclaimed, “you get to think, and you can use whatever codes you want to tell your story!” The students said that their Ozobot map took a week to create. First, the students thought of the story. Next, they coded and proceeded to match the coding to the story. Then, they designed the board. Coding is still work but in a more fun way. “Minecraft Fridays,” another activity Sheevers, Fraser, and Kole embedded into the classroom, are math lessons based on the video-game Minecraft that occurred every Friday in one building. Each lesson throughout the week led up to Minecraft on Friday. In order to participate in the lesson, the students had to be prepared, present, and be on their best behavior. As a result, the students were highly motivated because they wanted to play Minecraft. In that building, the school had an increase in engagement and higher math scores on the state assessments. TCSD also utilizes technology in their writing and reading lessons. Book Creator, an online template, allows students to create their own books and share them with their peers. Book bins, which are a collection of videos, articles, and research from the internet, allow students to practice digital citizenship, such as determining the credibility of an author, deciding whether a source is appropriate, and the difference between factual articles and opinionated articles. Digital notebooks are convenient because they provide easily accessible digital portfolios. Students must be taught to pause and think about the information they are receiving. Students must also be able to examine a source: where did it come from? Who wrote it? Are others using the source? Using and determining whether information is accurate remains a crucial component in 21st century curriculum, and book bins allow students to gain proficiency in this skill. Book bins are a resource for discovery and creation that provides ownership, choice, and the ability for students to work at their own pace. Sheevers, Fraser, and Kole emphasize the importance of digital citizenship, especially at the lower levels. They prioritize teaching their students what it means to be a safe and responsible citizen, while demonstrating to teachers how digital citizenship fits into their curriculum. Before using any of the technology, the students learn the digital literacy and knowledge necessary to practice the skill. They spend time interacting with digital texts and learning their features. “There was a point when all our kindergarten students could use a mouse. Now, they come in and try to poke the computer or swipe the screen. There’s a whole new set of skills to teach them,” Sheevers expressed. Above, left: Students surrounding their Ozobot map at the NERIC conference. Above, right: Students engaging in a STEAM day activity at school. Below, left: Two students creating in the Makerspace station of STEAM days. Before the students had access to the technology, Fraser and Kole taught Digital Citizenship lessons in each ELA class. The high school even had a Digital Citizenship day, with lessons about digital footprints, how to use research appropriately, and how to cite sources. “If they want to use the technology, they have to use it responsibly,” Sheevers emphasized. TCSD follows the ITSE standards, which include equipping students with the knowledge to interact in positive, safe, legal, and ethical behavior while using technology, what information can be utilized and shared, and ensuring that students are aware of the permanence of their actions online. It’s essential that technology is purposeful; technology should allow students to create and think critically, according to Sheevers. She also emphasized the importance of designing the instruction with the technology in mind. Time is the most significant barrier to the inclusion of technology in education; “our teachers want to [include technology in the classroom], but it’s hard when there’s attendance issues, a new literacy curriculum, new common core standards, a new principal, so finding time is difficult. It’s important to show the teachers that we really are here to help them, not to add anything extra, and show them how it will save time in the long run,” Sheevers expressed. Sheevers, Fraser, and Kole aim to make technology relevant to what the teachers are already doing in the classroom in order to bypass time restraints. They emphasize to faculty that the inclusion of technology does not take away from instruction, but rather, builds upon it: instead of treating the lesson and technology separately, they frame technology as supporting the lesson for the day. Pathways in Technology Early College High School (P-TECH), a program initiated by TCSD, “puts high school students on a direct career path to the region’s most in demand fields including technology, biotechnology, and advanced manufacturing” (About P-TECH). Students take both high-school and college-level courses and can earn 20-30 college credits before they graduate. If they successfully complete the program, P-TECH students will earn a Regents High School Diploma and an associate degree at no cost in Biotechnology, Electrical Engineering, Manufacturing Technology, and more from Hudson Valley Community College (HVCC). The program begins the summer before 9th grade and offers job shadowing and internship opportunities (About P-TECH). Introducing technology into the classroom can be intimidating. There are hundreds, if not thousands, of platforms and websites available for teachers and districts to utilize. To avoid becoming overwhelmed, Fraser recommends that teachers begin with choosing one technology that they want to integrate and build up from there. Sheevers recommends trusting the students. “The kids aren’t afraid. You can learn so much from them.” Not only does technology make learning more exciting and engaging, technology ensures that learners of all kinds can access and understand the curriculum. “All of our students learn differently. You can’t teach every student the same way, so having technology as a tool helps to meet the different needs of our students,” Sheevers stated. TCSD serves as an example of a district that has embraced the power of technology in education and serves as proof that once a district dedicates time, effort, and funds to embedding technology into their curriculum, the possibilities are endless. The eleven students that presented alongside Sheevers, Fraser, Haegle, and Kole at the NERIC conference. “About P-TECH.” Troy City School District.